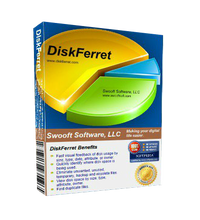 DiskFerret is a disk space analysis and management tool. DiskFerret Personal 2.2.0 was available as a giveaway on September 16, 2017! 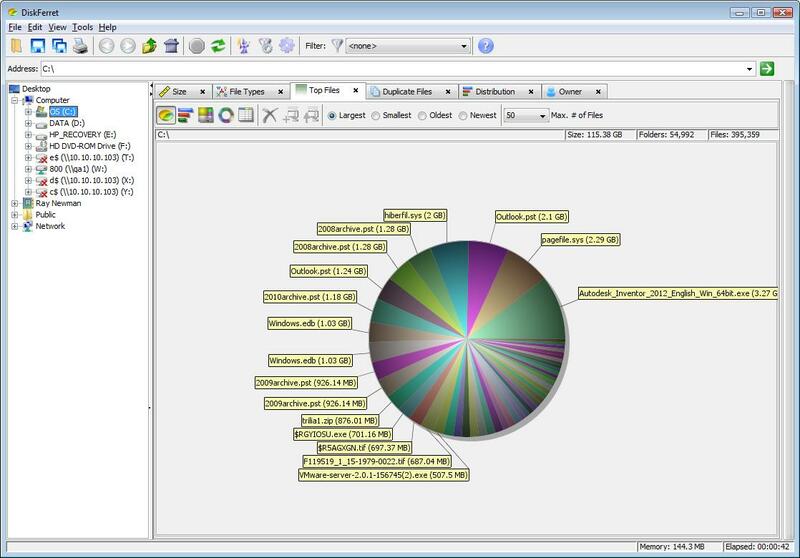 DiskFerret is a disk space analysis and management tool. It analyzes the files within a drive, network share, or folder, and provides charts and detailed information to help you understand where and how disk space is being used. Drive Monitors continuously monitor local or remote drive free space and notifies you via email when you are low on space. -Fast visual feedback of disk usage by size, type, date, attribute, or owner. 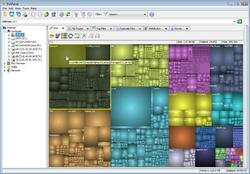 -Quickly identify where disk space is being used. -Eliminate unwanted, unused, temporary, backup and obsolete files. -View disk space by size, type, attribute, owner. -Scheduled scans save you time. -Email notification of low disk space conditions. -Quickly identify the largest, smallest, oldest or newest files. 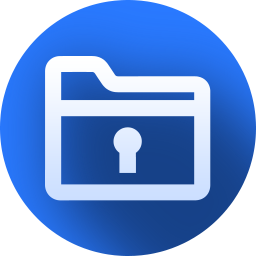 -Identify file owners using the most space. -Pre-configured and customizable filters to analyze by file type, name, date, and size. (includes regular expression support). -Global exclude filters to eliminate specified folders and files, or files with specified attributes, from scans. -Quickly remove space wasting junk files and protect your privacy with the Cleanup Wizard. -Reduce cost of data management. NB: Lifetime license, free upgrades for minor versions only; upgrades to Professional and/or future versions are available; Tech Support is not included. DiskFerret Professional ($50.00 value) for the best 5 enhancement ideas! USE Idea Informer widget! Windows XP/ Vista/ 7/ 8/ 10; Windows Server 2003/ 2008/ 2012 (Both 32-Bit and 64-Bit Supported); 32-bit Pentium or similar (400MHz or greater recommended); 256MB RAM system memory (500MB or greater recommended); 10MB available disk space; 800x600 resolution with at least 256 colors (1024x768 or higher recommended); Java Runtime Environment 1.6_07 or greater. How would you improve DiskFerret Personal 2.2.0? it should be easier to select a drive. It is free, quick, small, easy and PORTABLE. I use Scanner.exe - you can download it here: http://www.steffengerlach.de/freeware/ It is free, quick, small, easy and PORTABLE. Same problem like many other here. DiskFerret is starting and after one second it disappears. Found this software wouldn't run after installation .. unless 'Run as administrator' option was selected .... despite current user being Admin ?? The Free Version and PROFESSiONAL Versions have been around for years. Big waste of my time. Needs Java and I don't have Java. Would NOT install. Have to remove from the computer along with Jawa, too. Have tried and install but cannot activate through the key which I Got through the Email and the key was as below:- AJQK0-N0N00-YZG3H-1813M-1P2EW-T7K7Z-CMUQVFS8 Have to remove from the computer along with Jawa, too. This thing is running on Java!!! Really!!! I am not sure why everyone is complaining about. Here is the short n hairy of it. Activation was fairly straight forward goto web site enter info. goto mail box copy n paste serial . No issues on windows 10 x64- 16288 rs3. . I read comments downloaded both tried windirstat then diskferret. there is only a passing resemblance ---diskferret scanned ssd in under 20 sec. win took almost a min.--and there is a world of difference between the two. i for one would like to thank the maker for the software . and will use it fully. thank you. This looks distinctly like a rip of of the FREE WinDirStat. Installed on a Win 10 Pro 64 bit (patched to date) system and it runs for a fraction of a second and bombs out. So now I've had to apologise to those that I shared the link with, to say sorry for posting such crap. I shall not be doing that again. Making it tedious to download software, other than after sharing a link, is just not on. You've just lost a lot of subscribers. Installed on a Win 10 Pro 64 bit (patched to date) system and it runs for a fraction of a second and bombs out. So now I've had to apologise to those that I shared the link with, to say sorry for posting such crap. I shall not be doing that again. Making it tedious to download software, other than after sharing a link, is just not on. You've just lost a lot of subscribers. I do not like this program at all! There are some problems: 1) Some sequesters aren't readable or just 1/2 of what it should be! 2) It doesn't scan more than the C:! I've tried to tell the program to scan my other drives but this program would not do that! 3) If the program isn't well done, DON'T WASTE YOUR TIME INSTALLING THIS "free" download! I do not like this program at all! There are some problems: 1) Some sequesters aren't readable or just 1/2 of what it should be! 2) It doesn't scan more than the C:! I've tried to tell the program to scan my other drives but this program would not do that! 3) If the program isn't well done, DON'T WASTE YOUR TIME INSTALLING THIS "free" download! Tony, than stay away from THIS site and you will not have longer time waste your time!!! nibo1978, It was my experience and I hope I can have an a honest opinion - or are you a democrat that would forbid me to have an opinion other than YOURS??? Installed on Win10 x64, runs fine, works fine, reminds me of WinDirStat but seems to have more features. Will carry on testing. Thanks. a program which requires Java to run!??? What is the developer thinking? Nobody wants to install Java. $25? This is not even worth the price of free. The developer has to drop Java before I even would bother to install this program. Problem with license server - won't validate license. Please advise how to validate the license code I was emailed. Problem with license server - won't validate license. License validation error. Status=514 LicenseType=65 Message from ValidateLicense=Failed to validate request because the time between server and client is not syncronized. Difference in time is > 713 Please advise how to validate the license code I was emailed. Don, I get the same error message except the difference in time says > 1093. Then, when I cancel the program Java runtime crashes. The biggest downside I've found to DiskFerret is its requirement of Java. I run both Win7 & Win10, have long had Java 32 bit installed in 7 for another app or two [latest = Version 8 Update 144 (build 1.8.0_144-b01)] [64 bit won't work with those apps], but feel it's not worth the hassle [& risk] to install Java in 10 or on any of our other Windows devices. So I've moved on to alternatives that don't use Java -- Google "disk space analyzer" [w/out quotes]. Where I've found DiskFerret & similar most useful is is on smaller SSD & eMMC drives, where space is at a premium. The space hogs I usually try to relocate are sometimes GBs of samples or FX in the User folders, from audio, video, graphics, & image editing software. Installing software can sometimes mean copies of the setup file(s) left in ProgramData &/or Windows\Installer\ &/or the program's folders, & those files can sometimes be huge. I make it a practice to manually update software, because when software updates itself the downloaded update setup file can often be stored in ProgramData. Driver setup files can be very large, e.g. AMD graphics drivers routinely run 400-500 MB, & copies of those get stored in C:\Windows\ System32\ DriverStore\ FileRepository\. OTOH you don't need a disk space analyzer to tell you to clean out your temp folders or browser cache, or when it comes to old Windows Update files -- running Windows Disk Cleanup after an update in 10 routinely removes 3-5 GB of leftovers you don't need. The biggest downside I've found to DiskFerret is its requirement of Java. I run both Win7 & Win10, have long had Java 32 bit installed in 7 for another app or two [latest = Version 8 Update 144 (build 1.8.0_144-b01)] [64 bit won't work with those apps], but feel it's not worth the hassle [& risk] to install Java in 10 or on any of our other Windows devices. So I've moved on to alternatives that don't use Java -- Google "disk space analyzer" [w/out quotes]. 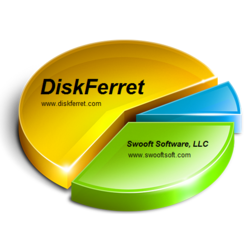 Where I've found DiskFerret & similar most useful is is on smaller SSD & eMMC drives, where space is at a premium. The space hogs I usually try to relocate are sometimes GBs of samples or FX in the User folders, from audio, video, graphics, & image editing software. Installing software can sometimes mean copies of the setup file(s) left in ProgramData &/or Windows\Installer\ &/or the program's folders, & those files can sometimes be huge. I make it a practice to manually update software, because when software updates itself the downloaded update setup file can often be stored in ProgramData. Driver setup files can be very large, e.g. AMD graphics drivers routinely run 400-500 MB, & copies of those get stored in C:\Windows\ System32\ DriverStore\ FileRepository\. OTOH you don't need a disk space analyzer to tell you to clean out your temp folders or browser cache, or when it comes to old Windows Update files -- running Windows Disk Cleanup after an update in 10 routinely removes 3-5 GB of leftovers you don't need. Sorry about the earlier false alarm, displaying C HD does work just fine, my 'bad' in selecting it. Sorry, won't run on Windows 10 64 bit. Uninstalled. Steve Murray, it runs perfect on my Windows 10 Home 64 bit (1703) and with Java (8 Update 144). Steve Murray, have you Microsoft Visual C++ 2008 Redistributable on your PC? this needs the software, too. >>> Problem<<<: Does not display the whole C disk (SSD here) ! only smaller folders, like My Documents etc. Please advise about this problem which greatly restricts useability. Eldad, could be a rights issue, may need to be run as an administrator to see most of the files on a system, still won't see all as some folders are only accessible as "TrustedInstaller" or "SYSTEM" user. Thank you very much for the program, works fine on XP-PRO-SP3. Annoyance/limitation: On Treemap chart (the squares), the font is too small to read. Any way to increase it a bit? What does this do that spacesniffer can't? I want all of you to be aware of a freeware alternative: WinDirStat 1.1.2. The program DiskFerret Personal 2.2.0 is a direct copy of the freeware WinDirStat except some purely cosmetic additions. Shame on Swooft Software who´s not only using someone elses freeware as their own, but also charging $25,00!!! You can read about it here https://windirstat.net/download.html where you also will find permalinks for downloading + the source files are available at sourceforge. swejack369, how can this be a direct copy of WinDirStat when that project is built in Visual C++ and this is written in Java... at worst its similar to a port of it but it certainly is NOT a copy at the source level. I believe SequoiaView predates this and WinDirStat with the squarified pincussion treemap space representation the last version I am aware of was 1.3 in November 2002 I prefer SequoiaView original design for the squarified pincussion treemap to both of these copies of the idea. WinDirStat looks closer than todays giveaway though probably due to difficulty to get the same look and feel in Java... Also the other problem with using Java is we can probably decompile this and remove limitations and recompile... and Java being a p-code language is always slower than a properly compiled into native code language like C++ also do you trust non-elevated java to see every file on a drive? I don't! swejack369, how can this be a direct copy of WinDirStat when that project is built in Visual C++ and this is written in Java... at worst its similar to a port of it but it certainly is NOT a copy at the source level. I believe SequoiaView predates this and WinDirStat with the squarified pincussion treemap space representation the last version I am aware of was 1.3 in November 2002 I prefer SequoiaView original design for the squarified pincussion treemap to both of these copies of the idea. WinDirStat looks closer than todays giveaway though probably due to difficulty to get the same look and feel in Java... Also the other problem with using Java is we can probably decompile this and remove limitations and recompile... and Java being a p-code language is always slower than a properly compiled into native code language like C++ also do you trust non-elevated java to see every file on a drive? I don't! swejack369, thank you for mentioning this. I agree with you that software developers who use someone elses work, especially work that is freeware then pretend it's their work and moreso then sells the software for profit is appalling. I don't usually bother to read the comments unless I have a problem with the software given away and then only to check to see if anyone else has had the same issue. I couldn''t get today's giveaway to work due to a problem validating the license, so appreciate the heads-up on the freeware version. Will install WinDirStat to see if it's a useful application. "Error opening file for writing". Installation aborted. Using 32-bit Win10. 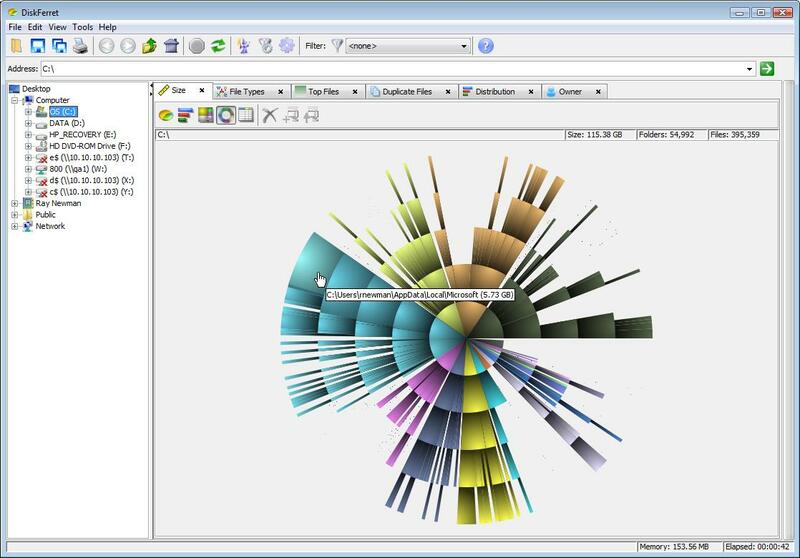 Windirstat is an always free tool, readily available. 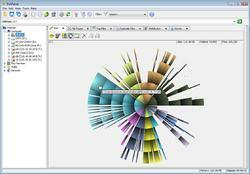 Windirstat <https://windirstat.net> is an always free tool, readily available. I installed on Win 10 and was successful. Still learning more about it, but like it so far. Ron DeVes, have you allow the program to install Microsoft Visual C++ 2008 Redistributable? Refused to go past activation screen given a valid activation code (no proxy server). Then after a while came up with a java error. Seems like a gigantic waste of time. Don't bother. This program "requires" Java 1.6. The current Java version (which I have) is 1.8. Therefore - you've guessed it - this stupid program wouldn't run. Uninstalled. David J Wilson, my virtual W7 64 Pro has no Java at all. When I installed jre-8u144-windows-x64.exe, the giveaway ran smoothly. That installed Microsoft Visual C++ 2008 Redistributable - x86 9.0.21022?? David J Wilson, my virtual W7 64 Pro has no Java at all. When I installed jre-8u144-windows-x64.exe, the giveaway ran smoothly. That installed Microsoft Visual C++ 2008 Redistributable - x86 9.0.21022?? David J Wilson, I'm running latest java 1.8 and only 1.8 and have no trouble running the deskop program, and the web applet lite version runs without error though the GUI rendering is a bit flakey requiring mouse over to re-draw buttons and other GUI features. Drive Monitors continuously monitor local or remote drive free space and notifies you via email when you are low on space. Tom Thurston, Idem for me on windows 10 64 bits, begin to start with the logo of Disferret and nothing happens, even after reboot. Worse slow down my computer. Too bad. Tom Thurston, Windows 8.1 is alot better than 10. Ootje, and it works perfect on my Windows 10 home 64 bit.